The official opening day of the TCM Festival was full of great movies and great movie makers. Bruce Goldstein did his best Alex Trebek routine and conducted the official TCM So You Think You Know Movies quizzo. I joined in the fun and became part of a team of Festival veterans. From the East and South and all over the USA, Festival attendees have one thing in common - they know movies! So, we were all anxious to get the game started. Bruce explained the rules and it was like explaining the IRS code. Yes, the rules were tough because .... yes, that's right, everybody in the room was a movie buff! Bruce would play a movie clip and then ask a question. It was a multiple choice test so the answer could be either a, b, c, d or f - but wait there was a kicker. The answer could also be a and b or any combination OR it could be all of choices OR it could be none of the choices. .
OK, so who is Nikko?!! And who is Pat Walshe?!! Every other name on this list is seared into our collective memories. But Nikko? Read on and the answer will appear - and no googling when my back is turned. Don't demean yourself by looking it up. Well, need I tell you that our team didn't win. I did nail a few for the team, including this one. Take a couple of minutes to watch this beautiful scene from the Merry Widow directed by Ernst Lubitsch. The question was: what Hitchcock movie used this music as part of its plot. Bruce pointed out that Hitchcock often used musical themes in his movies as part of the plot - think of the tune that Robert Donat keeps whistling throughout The 39 Steps. Again, read on for the answer. The official Welcome Party gave us a chance to meet each other. While the majority of people at the Festival are over 40, there is a strong contingent of 'youngsters' who love classic movies. One woman from Texas was there with her daughter. This was their early mother-daughter trip when they got to be together with no kids and no spouses. She told me that her daughter was, at first, unwilling to watch movies in black-and-white. But then she saw The Little Foxes and her love of La Dame Bette did its magic and now both mother and daughter talk the code we all know - its the code of knowing these movies so well that just a line or word between us can conjure up the entire movie. For example, the other day I was watching a movie my brother and I love and sent him a one word message to tell him what I was watching - serpentine. Can you guess the movie? Thursday night was the Red Carpet as the stars came out to honor Martin Scorsese on receiving the first Robert Osborne award for film preservation and to honor Mel Brooks on the 50th anniversary of The Producers. A good time was had by all, including Leonardo DiCaprio who handed out the award to his friend, MS. I had the chance to see To Have and To Have Not introduced by Michael Uslan. Watching it at the Egyptian was a thrill in and of itself. Built in the 1920s on the grand scale, the Egyptian is a beautiful theater with a balcony! I was seated downstairs but soon sneaked out that seat and went up to the balcony - it had been years since I watched a movie from the balcony and it was like jumping into the wayback machine. I was a kid back in the great movie houses in Philadelphia all of which have been demolished in the name of progress - and greed. THATHN is great to watch with an audience. As Uslan said, this movie has the best chemistry between its stars than any other - and he's right. Bogart and Bacall set the screen on fire from the moment their eyes meet until they walk off hand-in-hand into the night. Uslan said that the movie was made on a bet between Howard Hawks, its director, and Ernest Hemingway, author of the book. Hawks told Hemingway that he could make a movie from Hem's worse book and, of course, Hem angrily answered, what's that? THATHN, Hawkes answered. And he was right, it is Hem's worse book. Today, it is almost unreadable because of the constant use of the n-word. So Jules Furthman and William Faulkner (yes, that Faulkner) re-wrote the entire book, keeping just a smidgen of the plot and characters. And yes, Hawks won his bet. And Bogart found a new love. Bacall and he were married soon after making this movie. When Bogie died in 1957, Bacall had a whistle placed in his coffin to commemorate one the great onscreen pick up lines when Bacall tells Bogie all he has to do when he wants her is to whistle - "you know how to whistle don't you? You put your two lips together and blow." And that was Thursday! See you tomorrow. 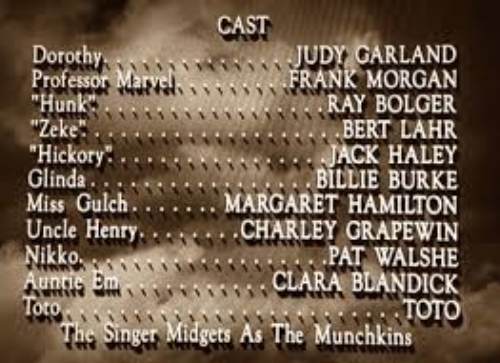 Oh, wait, the answers - Nikko was the head of the flying monkeys. Pat Walshe was famous for his vaudeville act imitating a monkey. The Merry Widow waltz is used by Hitchcock in A Shadow of a Doubt, with Joseph Cotton playing the widow-killing favorite uncle of Teresa Wright. Serpentine - From the In-Laws (1979).